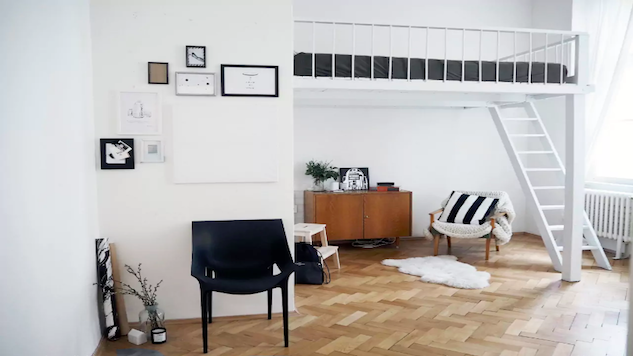 Airbnb Stay in the center of it all by booking this light-filled studio, located steps from Prague’s Old Town Square and the Charles Bridge. The no-frills yet stylish space offers a tiny kitchen and bathroom, a table and small seating area, and a loft bed. Past guests say the bed is comfortable but the kitchen lacks most tools needed to prepare a meal. Hosts Adela and Antonin will arrange transport to and from the airport. Airbnb Visiting Prague with a big crew? This sprawling apartment accommodates up to 10 guests with two bedrooms as well as two small extra beds in the dining room. There are also one and a half bathrooms and a large, updated kitchen. It’s two minutes away from tram and subway stops, although most of the city’s main attractions are within walking distance. Airbnb Every square inch counts in this super-efficient studio located in a restored 17th century monastery. The bed is a fold-out couch—and you’ll have to climb over it to get to the bathroom—but the spot is cute and clean, and the complex includes access to a common lounge area, laundry, and gym. There’s free street parking, and public transportation is about 15 minutes away. Airbnb This top-floor apartment (with an elevator) has views of the surrounding terra cotta rooftops, plus a sunny terrace for taking in the vista. It’s near Wenceslas Square, a major hub for dining and shopping in not-so-new New Town, which was laid out in the 1300s by Charles IV. The bathroom is fully stocked with toiletries and towels, and the kitchen has a small stovetop, microwave, and cooking supplies. Airbnb Provence or Prague? This French-inspired space has a queen-size bed and a single sofa bed, plus a lovely little terrace with a dining table and lounge area. It’s located in New Town, five minutes from the Vltava River and Náplavka, a popular waterfront area for drinking, dancing, and soaking up the local culture. Airbnb One past guest says this cozy apartment’s castle-side location makes it feel like “stepping out of a fairy tale.” With the ninth-century landmark and other major attractions just steps away, it’s hard to believe rates start at just $48/night. The apartment is recently updated but has charming historic details like parquet wood and colorful tile floors, and massive windows overlooking the street. Host Anna, a local student, promises a quiet stay with as many local favorites nearby as tourist hubs. Airbnb This attic apartment is in Prague’s old Jewish Quarter (Josefov), which is surrounded by the city’s Old Town. The sixth-floor space has a view of Prague Castle, and it’s right next to the Old New Synagogue, the oldest preserved synagogue in Europe. Host Vojtech offers a thorough guidebook with tips about the best views, cafes, galleries, and cocktail bars in the city. Airbnb With more than 100 five-star reviews, this colorful apartment has an open floor plan and a modern vibe. It’s five minutes from the nearest metro station, and a five-minute ride to Old Town, but there are also plenty of restaurants, bars, and attractions (like the Prague Beer Museum) very close to the apartment. Keep in mind that the area can be noisy at night—but that’s what you get for being in the middle of the action. Airbnb Located in a modern building a quick metro ride from the city center, this one-bedroom flat has a fully stocked kitchen (including free coffee), a washing machine, and a smart TV. Superhost Pavel is quick to offer tips on getting around the city, recommending nearby Fort Vysehrad and Zlute Lazne, “one of the best summer party places of Prague.” Parking is available under the building. Prague is one of the most popular Airbnb destinations in Europe. But unlike its fellow top cities London and Paris, it’s extremely affordable. With nightly rates averaging $67 at press time—and many perfectly fine private properties available for around $30/night—it’s no wonder the Czech capital is attracting so many budget-conscious travelers. We scoured the home-sharing site for attractive, clean entire-place rentals with good reviews, convenient locations, and low price points. Here’s what we came up with. Erica Jackson Curran is a former alt-weekly editor turned moonlight freelancer based in Richmond, Virginia.